Preparing red pepper sauce over wood fires: the smoky flavour is much appreciated by local customers. Throughout the project we have aimed to include teenage children in their mother's activities. The project began by encouraging women to use their land productively; in this case, growing pepper seedlings. 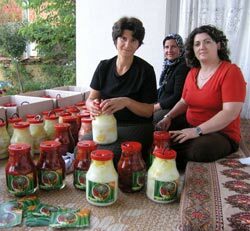 The Krushe Madhe Women's Group proudly display their first season's product range, September 2006. Two villages in western Kosovo - Krushe Madhe and Krushe Vogel - became a byword for horror when, following the 1999 war, it emerged that almost all the men and older boys had been killed in the ethnic violence that overtook the area. Many other communities around the town of Gjakova also experienced these atrocities. The widows were left in an extremely difficult situation, traumatised by their experiences and suffering from insomnia and depression. They were not even free in their bereavement: in Kosovo, women are traditionally under the control of their nearest male relative, however distant that relationship might be. As we gradually got to know some of these families in the course of the beekeeping project, we began gentle discussions about what they felt they could do and how we could help. The women each had access to several hectares of farmland and proposed using their land again for agriculture. They were starting from zero. They knew little about horticulture. They had no money for seeds, fertiliser or irrigation systems. They had no idea how to sell the produce and were not prepared to be seen in public in the markets. Above all, they were not used to taking initiatives or making decisions. Florinda Rudi joined the team, bringing six years' experience of post-conflict community development and lots of energy. She publicised the project in the villages, hired an agricultural adviser and encouraged the women to start sowing and planting. The most popular options were peppers and strawberries. As each group decided on their focus, we provided funds to help them get started. The adviser introduced new varieties to extend the season, installed polytunnels and simple irrigation, and organised training sessions. The first year's pepper harvest was a great success. The main group in Krushe Madhe village sold 900 kilos. 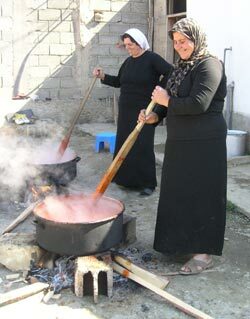 Then on their own initiative they started using the unsold peppers to make preserves. Soon they had three products, peppers preserved in yoghurt, salted peppers and red pepper puree. 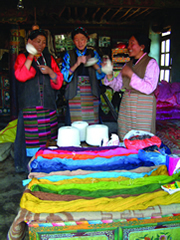 All are staple items in the local diet and easy to market. Florinda sourced the jars, devised and printed labels and helped the group develop their own distinctive brand. Once the group had demonstrated their commitment, we part-financed a processing unit. Several strawberry groups followed their example a year later by making strawberry jam under the same label. We have experienced difficulties. Some families are simply too traumatised to take advantage of the opportunities we have offered; some who participate see their initiatives halted by hostile family members. One participant's strawberry beds were ploughed up by a jealous brother-in-law. However, to date, 170 widows and 300 children in eight villages have benefited from this project, which has increased their annual income by an average of 200 per cent. The project will continue benefiting increasing numbers in the future, as more women join the processing groups, or follow the example of our pioneer groups. And the women now smile and laugh. They couldn't do that five years ago. Grant funding from Irish Development Co-operation (Irish Government) and Transrural sponsors. Thanks to volunteer adviser Ian (Tolly) Tolhurst. 2009 up-date. Eleven years after NATO forces successfully completed the 3-month bombing campaign of Belgrade to put a stop to “ethnic cleansing” in Kosovo, Transrural Trust was awarded second prize in the Erste Foundation Award for Social Integration, for its work with Kosovan widows and their children who were affected by the 1999 ethnic conflict. The only award of its kind in the region, it gives recognition to, and promotes, outstanding organisations and projects that aim to create a stable and just society with equal chances and opportunities for all, including disadvantaged and marginalised groups. The call in 2009 received more than 1,300 applications from eight countries from Central and Eastern Europe. Non-profit organisations, public administrative bodies, civil-society and private initiatives, religious communities and media organisations were eligible to apply. The 20 most exceptional projects were selected by an international jury of 17 experts. 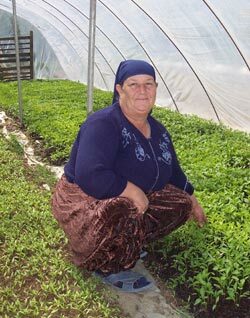 The 30,000 euro prize money was paid to Transrural’s local partner in Kosova, to enable it to extend its support programme to widows and their families in other villages.